Can Children Over 1 Eat Raw Honey? 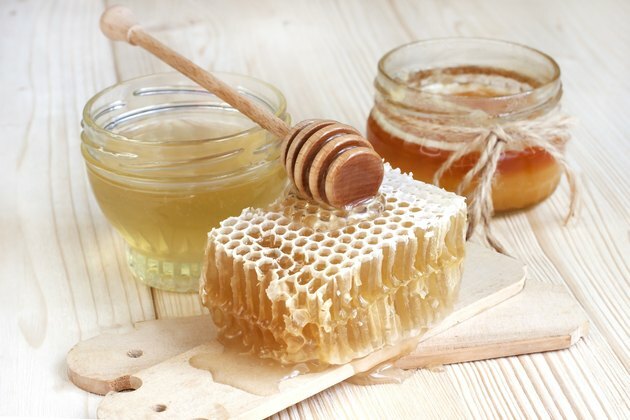 Honey was one of the first natural sweeteners used by humans. It is used not only as a food, but also as a drug and topical ointment. Honey has been used in infant nutrition and as a medicine, but it is unsafe for babies under 1 year old due to botulism spores. Although infant botulism is rare, with fewer than 100 cases reported per year, it can be deadly, and it is avoidable. According to a review in the “Journal of the American College of Nutrition,” honey was once used as a source of carbohydrates in infant nutrition, as infants fed a honey and milk diet were found to gain more weight and were less susceptible to disease than infants fed normally. Some parents give raw, local honey to children, as it is thought to prevent allergies. Honey has also been shown to be an effective cough suppressant. Even with the possible benefits of honey, the Centers for Disease Control and Prevention, the American Association of Pediatrics and the National Honey Board have recommended that it not be given to infants under 1 year old. Botulism is a serious illness that leads to paralysis and can be fatal. It is caused by a nerve toxin produced by clostridium botulism. Foodborne botulism is the result of eating foods that contain this toxin. In infants, the spores in honey can induce botulism, as an infant’s immature intestine allows the spores to grow and multiply, producing the toxin. The digestive tract of older children and adults is able to prevent spore survival and growth. A survey of honey in the U.S. found that 10% of samples contained botulism spores. Simply heating the honey does make it safe, as six hours at boiling temperatures is required to kill the spores. The only way to prevent botulism in infants is to avoid all honey during the first year of life. It is considered safe for children older than 1 year. The first sign of infant botulism is constipation. The infant will appear lethargic, have poor sucking ability, and have a weak cry and poor muscle tone. These signs are due to the muscle paralysis caused by the toxin's blocking of the transmission of nerve impulses. If left untreated, the paralysis will move to the limbs and respiratory system. If you suspect your child has botulism, get medical care immediately.